Depending on what school of thought you believe, the stereotypical ‘Ninja-To’ is either pure myth propagated by popular media or martial tradition traced back centuries in Japan. Well, if EITHER of those is true, then you’d think the short, straight bladed sword with square guard would show up in manga once in a while. But it doesn’t. 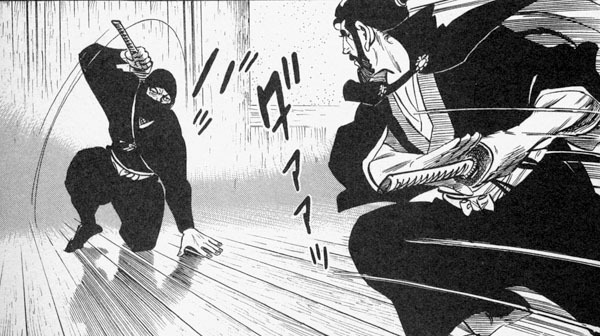 Depictions of ninja swords in manga are a mixed bag over the decades, but a lot of what you see are short, curved blades of the less-decorated variety, worn as often through the belt as they are on the back. This might be little more than artistic preference. 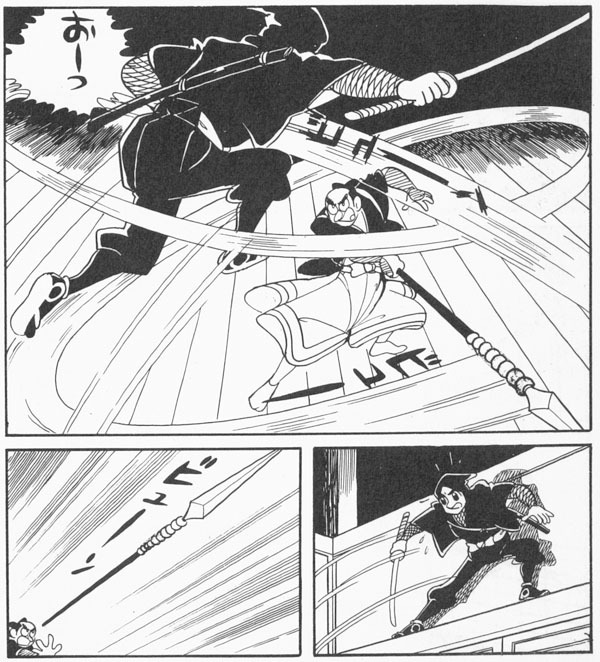 I think illustrators like Mitsuteru Yokoyama (above) and Shirato Sanpei liked drawing the curved blade, as it adds a sense of dynamic movement not necessarily there with a swinging straight blade. 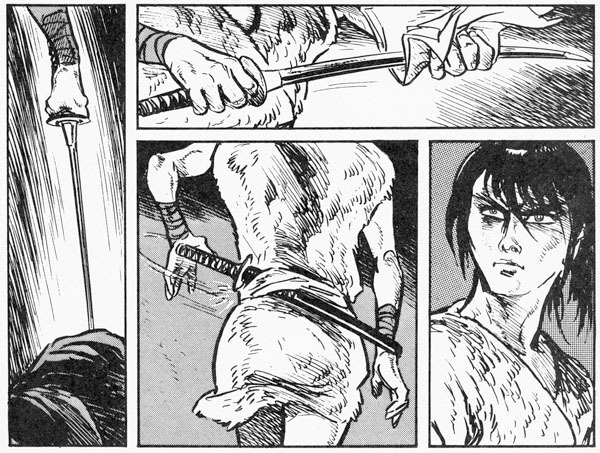 It’s also important to keep in mind manga artists work on insane deadlines, so consistency of blade style can vary from panel to panel. One can find an isolated drawing or two with what looks like a straight sword, but that doesn’t exactly constitute a deliberate statement of sword preference. 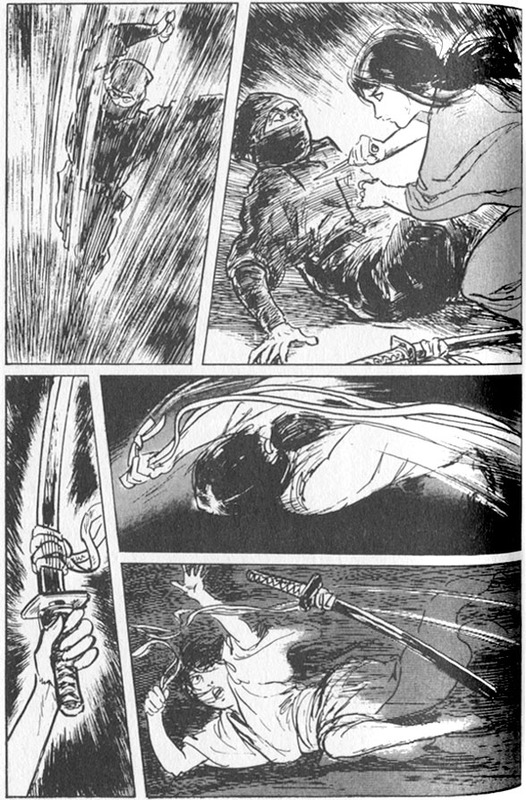 Kagemaru of Iga‘s curved blade (starting in 1961) seemed to change length depending on the panel layout and dramatic effect intended. This was one of the most influential properties of the 60s Japanese craze, but Yokoyama never made that strong a statement about sword style. 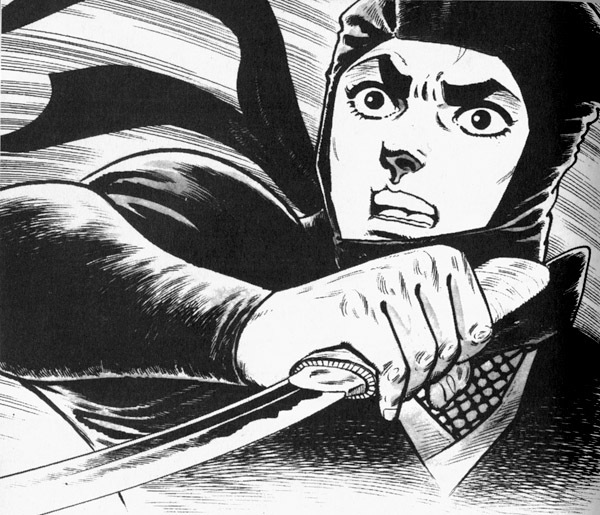 The 1963 film adaptation used a standard katana. Sanpei, however, was much more of a realist, especially later in his career. 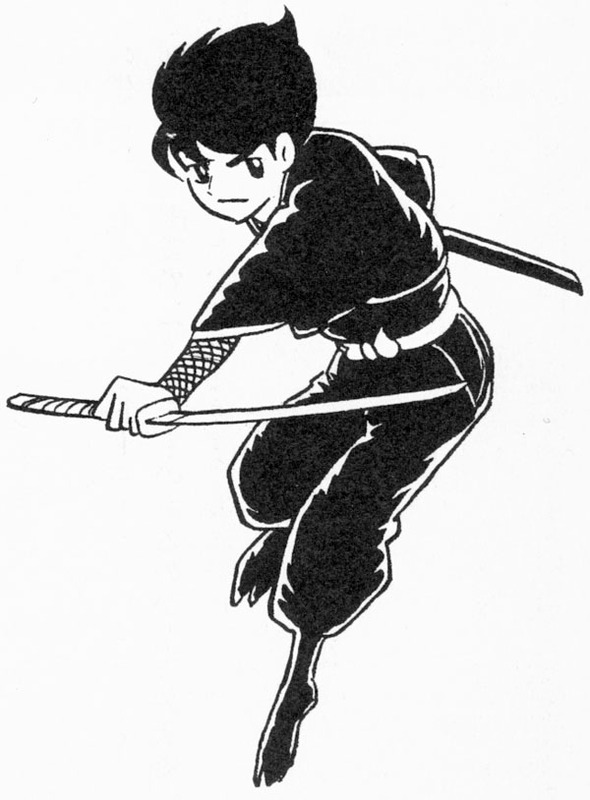 However both the mid 60s and early 80s incarnations of Kamui saw the character use nothing more exotic than a dressed-down wakizashi, although it was slung in the small of the back in a signature style. 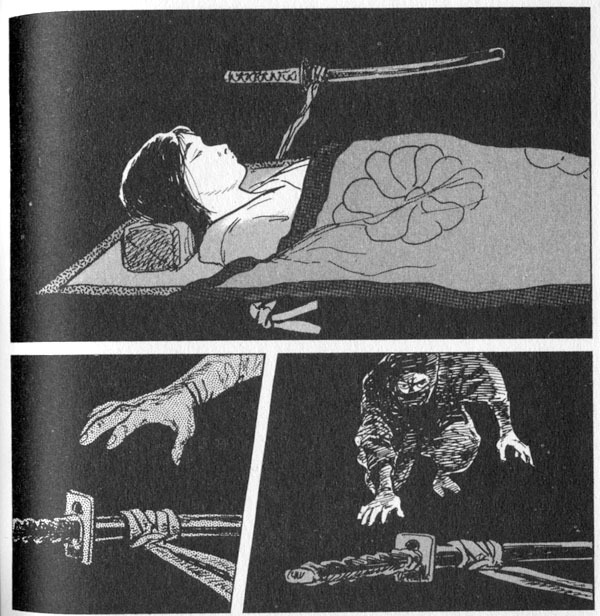 These panels are from the 80s Eclipse reprints, and may be partly indicative of why this superb, heady series never fully connected with mainstream ninja fans in the America. No black suit for the hero, no regulation ‘Ninja-To,’ so less visual shorthand to attract otherwise Kosugi-crazed shinobifiles. 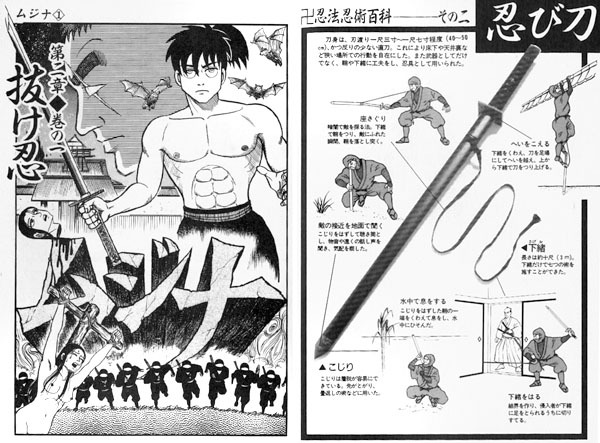 Takao Saito‘s hit ninja properties also featured short, curved blades for their ninja. 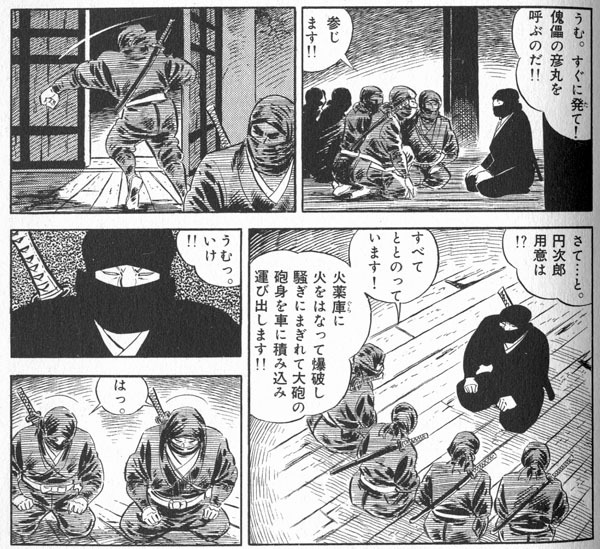 The 1969 shinobi massacre known as Kage Gari (The Shadow Hunters) is again all short curved swords, sometimes with square guards and worn on the back, but there is variety in there as well. Again, you also see some quickly rendered blades that’ll look straight at first glance. 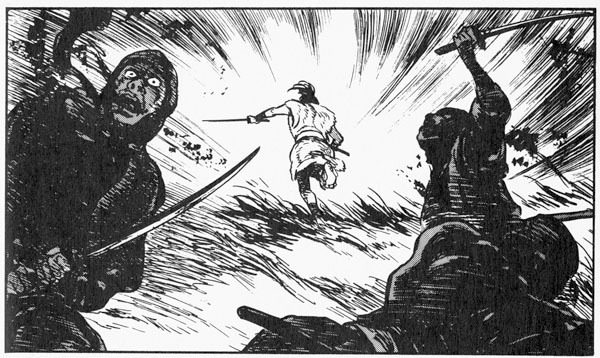 Zanpei Kumotori (1976-78) dispensed with the sword entirely, in favor of a long tanto cribbed in the small of his back. LOVE that minimalist statement, reminiscent of Sasuke’s commando kit in Samurai Spy. 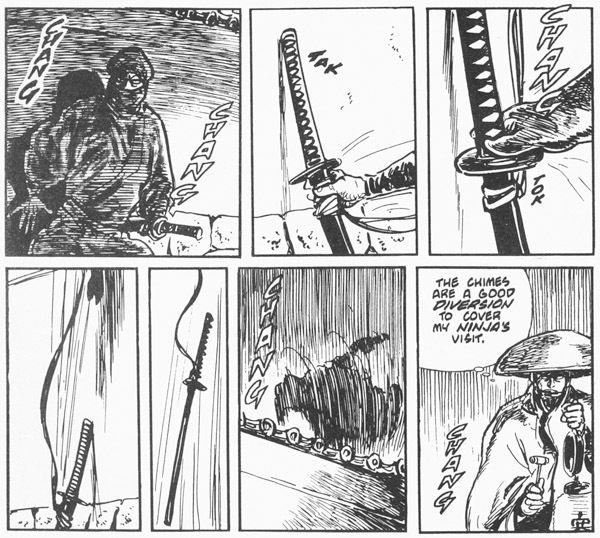 Goseki Kojima stuck to curved blades as well in the 1970 Lone Wolf and Cub series. These panels are a perfect example of perspective and speed of delivery making a curved sword look like straight for a second. This is why I don’t put a whole lot of faith in the “evidence” of old book illustrations pointing to the existence of the straight sword. And here’s a similar look three decades later, a Kunoichi’s blade from the same team’s Path of the Assassin (Hanzo no Mon). Now, I don’t have the most complete library of vintage ninja manga in north America or anything, but what I do have samples most of the significant series and stages of development, and the only thing I have that actually embraces the stereotypical ‘Ninja-To’ is this 1993 series called Mujina by Aihara Koji. 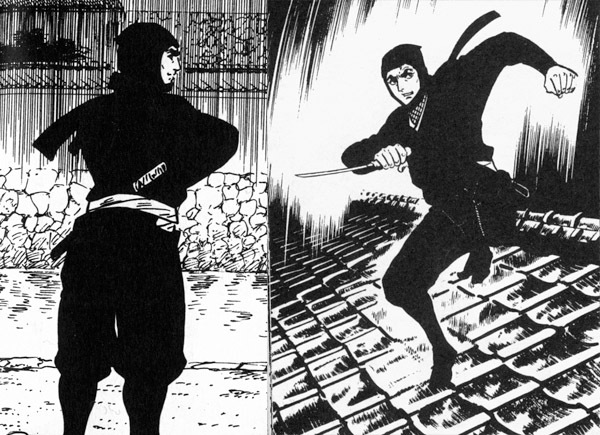 In an example of the snake biting its own tail, his ninja use the western craze-era notion of the regulation ninja sword, complete with catalog stock picture for reference. Eeewww…and it’s the long bladed, small guarded variety, too. This book is trying way too hard to be shocking and edgy, and the catalog ninja sword may be part of that misguided effort. 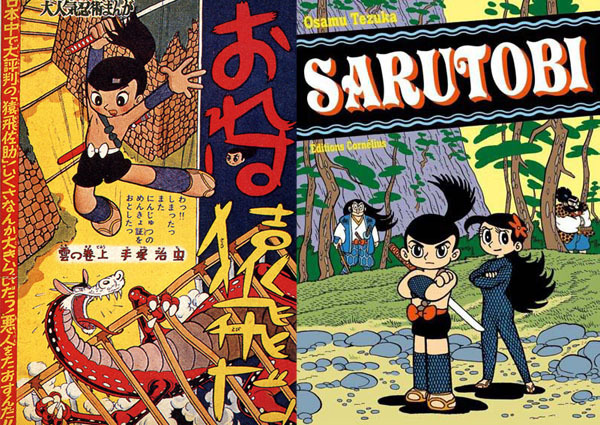 So, it wasn’t Japanese comics that cemented the regulation ‘Ninja-To’ into the our mindset, NOR did manga artists for the past half-century embrace the alleged martial arts history that should have been apparent in their own country. FILM though… as we’ll see next post… is a lot more partisan an art form. How can I learn to sword fight in one day? I think this is very interesting research. I found your website while I was looking through reference of Ninja. I’m Japanese, and an English learner. So please forgive my poor writing skill. I read the blog really quickly(I’m at work!! heheh), and amazed how you have lots of reference of old comic. While I was looking at anohter Japanese website that sells Ninja goods, I found explanation of difference between Samurai sword and Nija tou. Actually Ninjatou’s explanation on the website is similar to the manga you put here..”MUJINA”. (the last one) The right side pages says charactaristic of Ninja tou. Such as “short blade(to use in small space), and straight(the purpose is mostly stab),square shell(to use for climbing) and pointy shealth(to sab the ground when Ninja climb the wall). I didn’t know these facts, so I was surprised. You may be alredy knowing it. 🙂 I’m not sure if these facts are historically true, so I will study more. Anyway thanks for showing cool website!